In celebration of this, we’re proud to announce our poster campaign at major London stations. We are looking for volunteers, fundraisers, supporters and patrons to help us grow and help more people and families affected by this complicated disease. Our poster campaign has been organized and implemented by the amazing Shem Booth-Spain and Admedia; getting right behind us with their help and support. Much gratitude to them. Our posters have been placed at King’s Cross, London Bridge, Euston, Cannon Street, Charing Cross, Liverpool Street, Paddington and Victoria. Niki De Lara formed Glaucomarize in July 2017, following serious uveitis and glaucoma that included the loss of her sight in one eye and almost losing the sight in her other eye; only to be saved by a brilliant and pioneering eye surgeon - Mr.Nitin Anand MBBS, MD (Ophth), FRCSEd, FRCOphth. Having realized that so many men, women and children around the world suffer from this incredibly 'tricky' disease (including some dear friends whose little girl is blind in one eye), Niki wanted to turn her difficulties in to something very positive that would help sufferers around the globe. 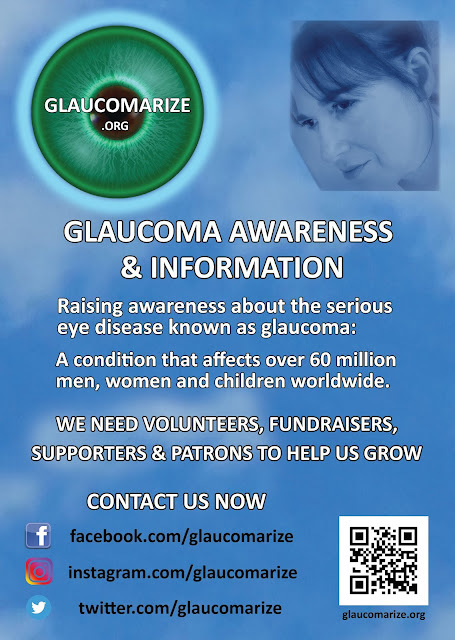 Especially as she has found that there is a distinct lack of awareness about this disease, which comes in many forms. 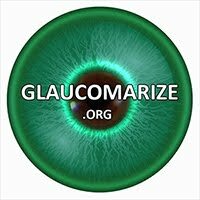 Hence the invention of a new transitive verb - "to glaucomarize" ... to raise awareness about the serious eye disease known as glaucoma.